Image courtesy of US Navy/John Williams. This article was originally published by War on the Rocks on 19 June 2018. But Beijing’s candid general is only partially right. It is certainly true that few if any militaries in the world share the depth and breadth of combat experience of the U.S. military, especially among its leaders. Senior U.S. generals have often served two, three, four, or even more combat tours overseas, encompassing everything from conventional combat to prolonged counterinsurgency operations against guerillas and sustained strike operations against terrorist groups. However, this deep bench of U.S. combat experience brings with it hidden flaws. As we recently wrote, assumptions and expectations about the next war are often deeply affected by recent experience, because the past is often a subconscious compass that navigates thoughts about the future. Thinking about the next war can be too easily bounded by projecting past experiences forward, a natural human tendency to think linearly about what might be, colored by what has been. But the next war, especially if fought among great powers, may have strikingly little in common with wars of the past. It may unfold in completely unanticipated ways, quickly surging outside the intellectual fence lines of even the most creative military thinkers. The next major power war will be the first war of the Fourth Industrial Revolution, and it may dramatically disrupt everything we think we know about the character of modern war. Klaus Schwab, Founder and Executive Chairman of the World Economic Forum, famously described the Fourth Industrial Revolution a couple of years ago. The first three industrial revolutions are well known. The first, from 1760 to 1840, brought the steam engine, railroads, and machine manufacturing. The second, from about 1870 to 1914, gave us electricity and mass production. The third, often called the digital revolution, encompassed the last decades of the 20th century and produced semiconductors, computers, and the Internet. The Fourth Industrial Revolution began in about 2000 and builds on the third to leverage the increasingly pervasive influence of the digital world in every aspect of modern life. Schwab argues convincingly that this new revolution is not simply an extension of the previous one. He contends the Fourth Industrial Revolution is entirely new, characterized by the blurring of the divisions between the physical, digital, and biological domains. An exploding number of technological breakthroughs in fields as diverse as quantum computing, biotechnology, artificial intelligence, robotics, and nanotechnology — and especially the synergies among them — are profoundly reshaping nearly all forms of human endeavor. Furthermore, this new revolution is distinct because of the exponential velocity at which it is unfolding; the unprecedented breadth and depth of its effects; and the ways in which it is disrupting and transforming companies, industries, countries, and even human society. The Fourth Industrial Revolution promises to be unprecedented in both its global effects and its disruptive power. Schwab’s book has generated some fascinating discussions about how the Fourth Industrial Revolution will affect governance, business, and society. But surprisingly little of this discussion seems to have penetrated the U.S. military and influenced its thinking about future wars. What will it mean to fight wars in a world characterized by the Fourth Industrial Revolution — and what will it take to win? Space and cyber. These two relatively new domains emerged from the third industrial revolution, but have never been fully contested during wartime. There are no lessons learned documents, no historic battles to study, no precedent for how warfare in these domains might play out — and no way to know how cripplingly destructive it could be to modern society. And any battles in those domains will also hinder — and could even debilitate — the U.S. military’s ability to fight in the more traditional domains of land, sea, and air, since vital communications and other support systems today depend almost entirely on space satellites and computer networks. Artificial intelligence, big data, machine learning, autonomy, and robotics. Some of the most prominent leaders in these fields are publicly warning about the dangers in an unconstrained environment. Military operations enabled by these technologies, and especially by artificial intelligence, may unfold so quickly that effective responses require taking humans out of the decision cycle. Letting intelligent machines make traditionally human decisions about killing other humans is fraught with moral peril, but may become necessary to survive on the future battlefield, let alone to win. Adversaries will race to employ these capabilities and the powerful operational advantages they may confer. A new generation of high tech weapons. The United States and some of its potential adversaries are incorporating the technologies of the Fourth Industrial Revolution into a range of innovative new weapons systems, including railguns, directed energy weapons, hyper-velocity projectiles, and hypersonic missiles. 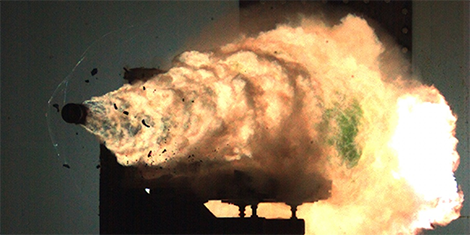 These new weapons will dramatically increase the speed, range, and destructive power of conventional weapons beyond anything previously imaginable. However, the U.S. military remains heavily over-invested in legacy systems built upon late 20th century technologies which compete against these newest technologies for scarce defense dollars. Here, rising powers such as China have a distinct new mover advantage. They can incorporate the very newest technologies without the huge financial burdens of supporting of older systems and the military-industrial constituencies that promote them (and, for authoritarian states, without adhering to democratic norms of transparency and civilian oversight). This challenge is severely exacerbated by the broken U.S. acquisition system, in which the development timelines for new weapons systems extends across decades. The unknown x-factor. Secret technologies developed by friend and foe alike will likely appear for the first time during the next major war, and it is impossible to predict how they will change battlefield dynamics. They could render current weapons inoperable or obsolete, or offer a surprise war-winning capability to one side. And it is entirely possible that technologies secretly guarded by one side or the other for surprise use on the first day of the next war may have already been compromised. The usual fog of war will become even denser, presenting all sorts of unanticipated, unfamiliar challenges to U.S. forces. The emerging characteristics of the Fourth Industrial Revolution suggest we are on the precipice of profound changes to the character of war. While the next major conflict will unquestionably exhibit all of war’s enduring human qualities, its battles, weapons, and tactics may well be entirely unprecedented. Military officers today may be marching, largely unaware, to the end of a long and comfortably familiar era of how to fight a major war. The study of warfare has always heavily relied upon scrutinizing past battles to discern the lessons of those as yet unfought. But in today’s world, that important historical lens should be augmented by one that focuses on the future. Fictional writings about future war can help military thinkers break free of the mental constraints imposed by linear thinking and identify unexpected dynamics, threats, and challenges of the future battlefield. Stories such as Ghost Fleet, Automated Valor, Kill Decision, and many others all can help creative military leaders imagine the unimaginable, and visualize how the battles of the next war may play out in ways the lens of the past fails to illuminate. This will help ensure the first war of the Fourth Industrial Revolution does not result from a failure of imagination, as the 9/11 attacks have been so memorably described. Adapting to the changing character of war in the Fourth Industrial Revolution will be a monumental challenge for U.S. military leaders — and that challenge will only increase in the coming decades as the vast disruptive potential of this era unfolds. Long-held doctrinal beliefs, personal combat experiences, and cherished and expensive weaponry may all need to be set aside to objectively assess how to fight and win in the coming years. General He may believe the Chinese military’s greatest weakness is its lack of modern combat experience, but no military — not even the combat-tested U.S. military — has any experience with the type of warfare the Fourth Industrial Revolution will produce. U.S. military leaders must continually push themselves to think in the most creative and unconstrained ways possible about how to prepare for the future battlefield. Simply making incremental changes to today’s legacy warfighting systems and processes could prove catastrophic against adversaries who successfully leverage the tremendous global changes to come. Lt. Gen. David W. Barno, U.S. Army (Ret.) is a Distinguished Practitioner in Residence, and Dr. Nora Bensahel is a Distinguished Scholar in Residence, at the School of International Service at American University. They are also Contributing Editors at War on the Rocks. For more information on issues and events that shape our world, please visit the CSS website.